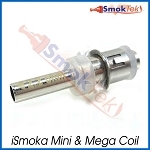 The iSmoka Mini BCC is a bottom coil clearomizer with 1.6ml capacity, perfect with eGo batteries! This version has silver, rather than black, top and bottom caps. It has a very user-friendly design that is easy to fill. The iSmoka Mini BCC delivers great vapor and flavor right out of the box, no break-in required. The iSmoka Mini BCC is eGo threaded, so it will work great on an eGo battery, but it can also be used on other 510 threaded devices/Mod's with an eGo adapter. Please note that some units may be labeled vapeonly. At this time, we are unable to offer replacement coils / coil heads for this unit. 1 Nice packing box to store the tank when not in use. Very good product with reasonable price. Base unit only comes in silver (black would be my choice). Wouldn't hesitate to buy again.